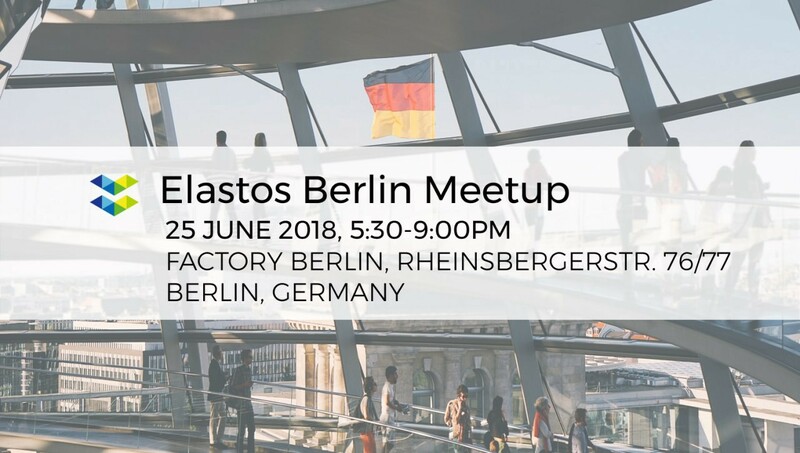 Elastos is in Europe and Asia this week and our invitation to the world to help build our network is about to go live. 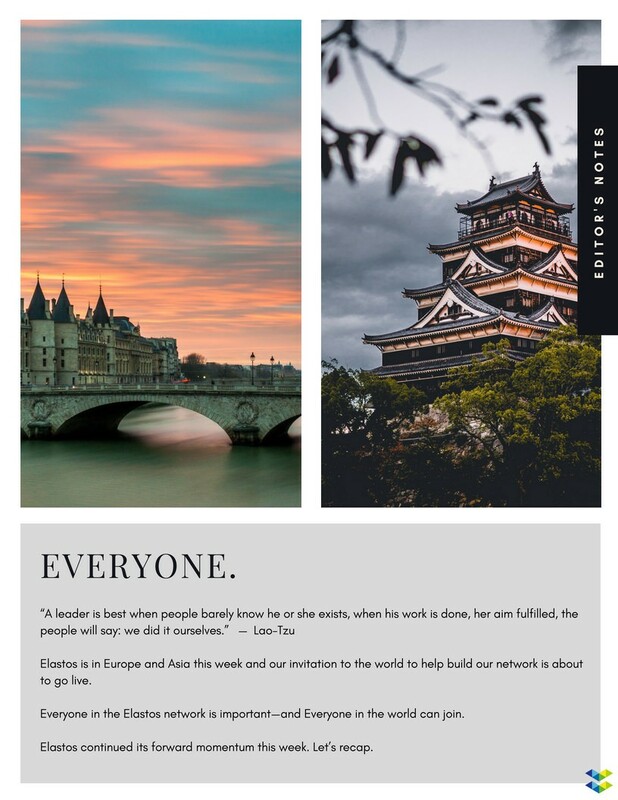 Everyone in the Elastos network is important — and Everyone in the world can join. 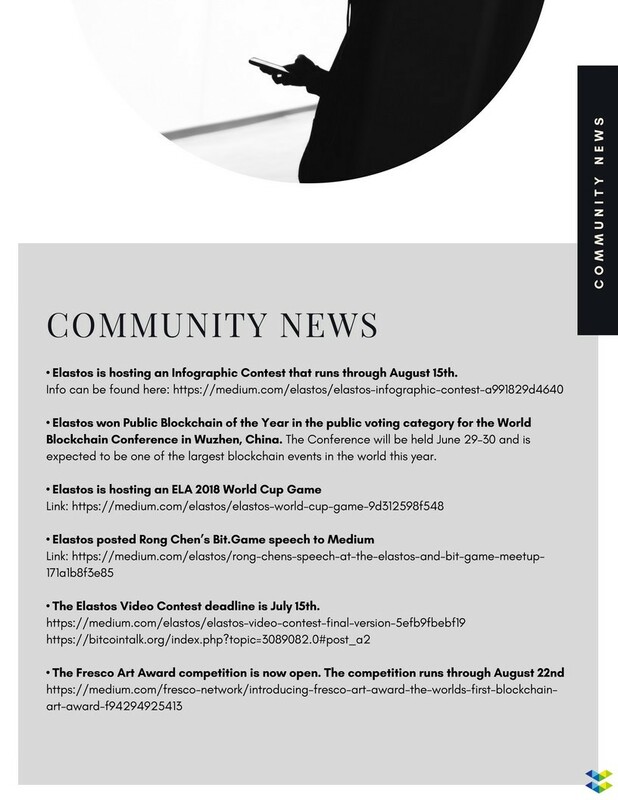 • Elastos won Public Blockchain of the Year in the public voting category for the World Blockchain Conference in Wuzhen, China. 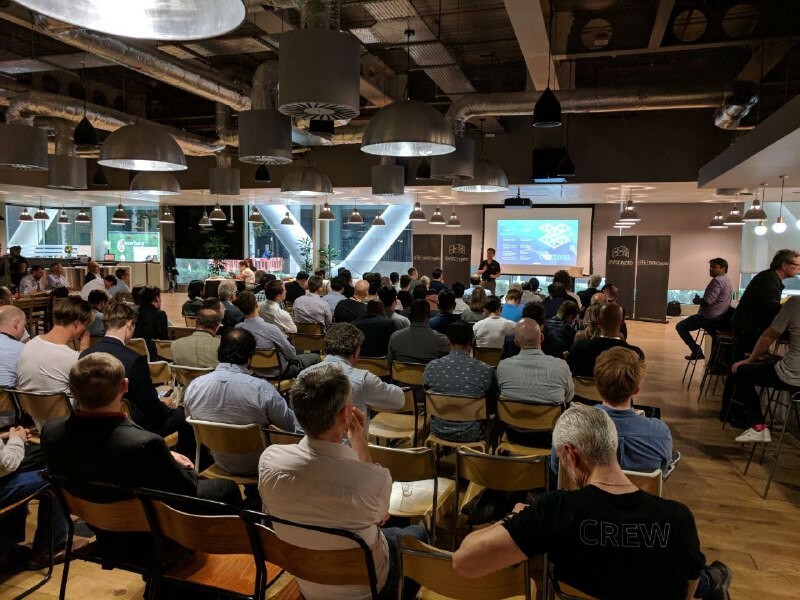 The Conference will be held June 29–30 and is expected to be one of the largest blockchain events in the world this year. Elastos China district PR director Hao Cheng and COO of BIT.GAME, Ding Wang, visited the Tencent R&D center in Chengdu where the top selling games “PlayerUnknown’s Battlegrounds” and “King of Glory” were developed. 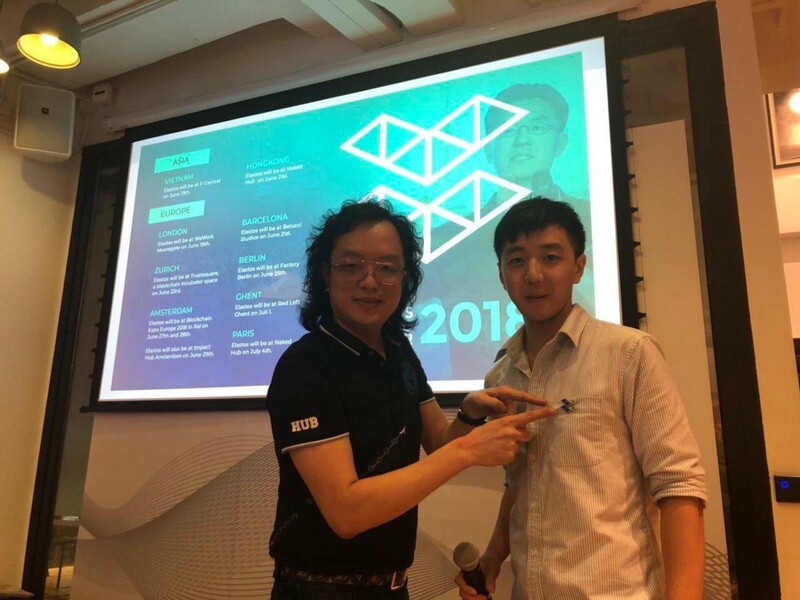 They met with Timi Studio Group and TAP 4 FAN staff and they discussed possibilities to develop blockchain games on Elastos sidechains. The two also visited the Alibaba Innovation Center in Chengdu. Finally, they visited a national leading blockchain security company, Knownsec (https://www.knownsec.com/#/) . Hao Cheng, Ding Wang and CTO Jilong Yang from Knownsec exchanged thoughts on potential collaboration opportunities on blockchain security. 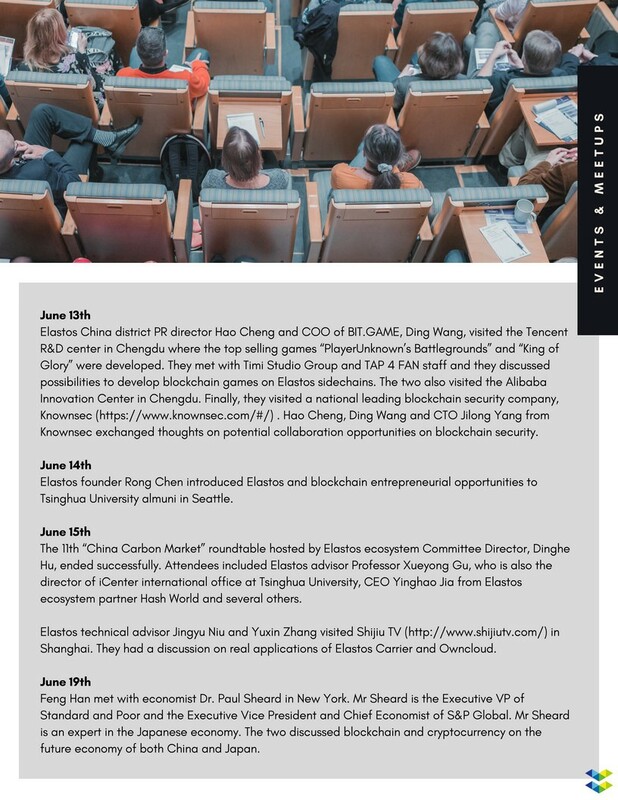 Elastos founder Rong Chen introduced Elastos and blockchain entrepreneurial opportunities to Tsinghua University almuni in Seattle. The 11th “China Carbon Market” roundtable hosted by Elastos ecosystem Committee Director, Dinghe Hu, ended successfully. 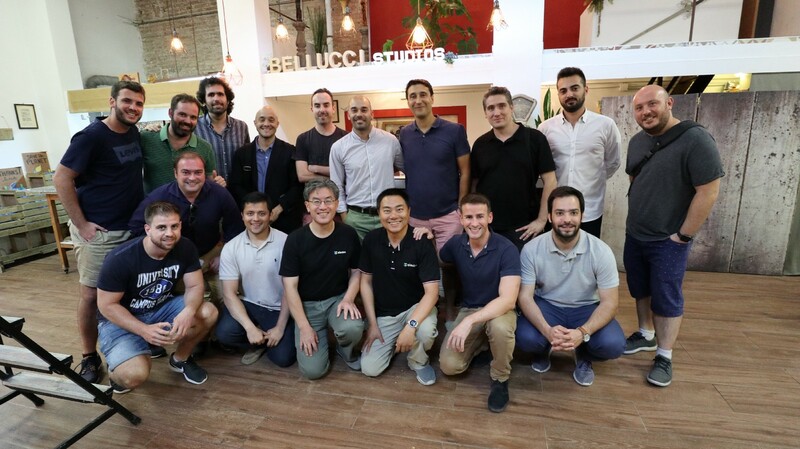 Attendees included Elastos advisor Professor Xueyong Gu, who is also the director of iCenter international office at Tsinghua University, CEO Yinghao Jia from Elastos ecosystem partner Hash World and several others. Elastos technical advisor Jingyu Niu and Yuxin Zhang visited Shijiu TV (http://www.shijiutv.com/) in Shanghai. 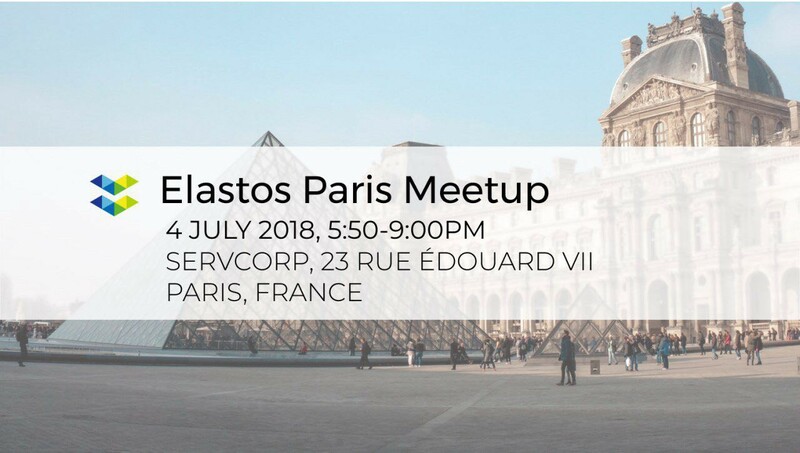 They had a discussion on real applications of Elastos Carrier and Owncloud. Feng Han met with economist Dr. Paul Sheard in New York. Mr Sheard is the Executive VP of Standard and Poor and the Executive Vice President and Chief Economist of S&P Global. Mr Sheard is an expert in the Japanese economy. The two discussed blockchain and cryptocurrency on the future economy of both China and Japan. 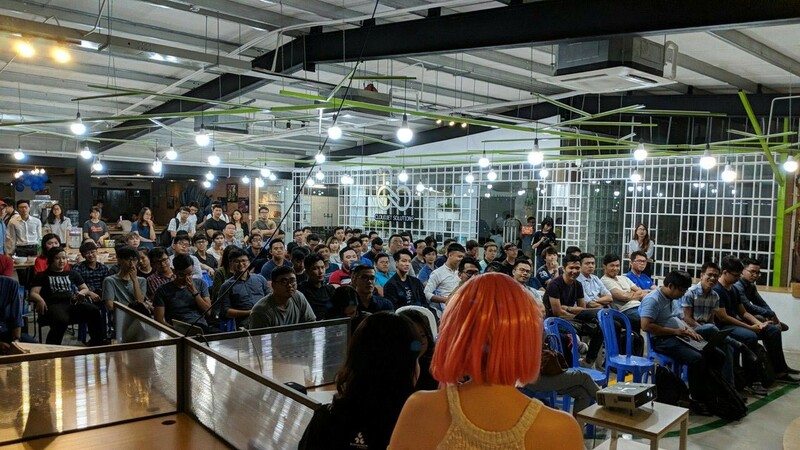 Elastos developer Clarence Liu hosted a meetup in Vietnam. 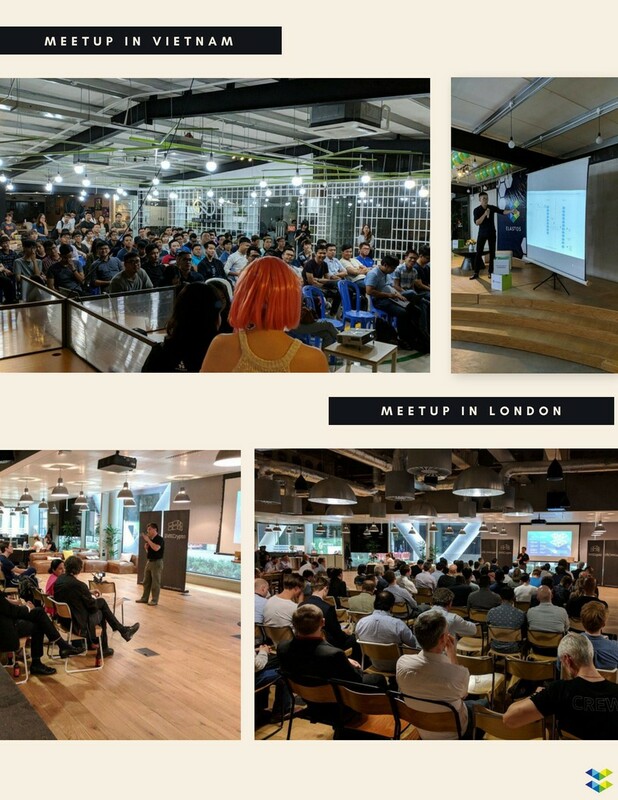 Rong Chen and kevin Zhang hosted a meetup in London. 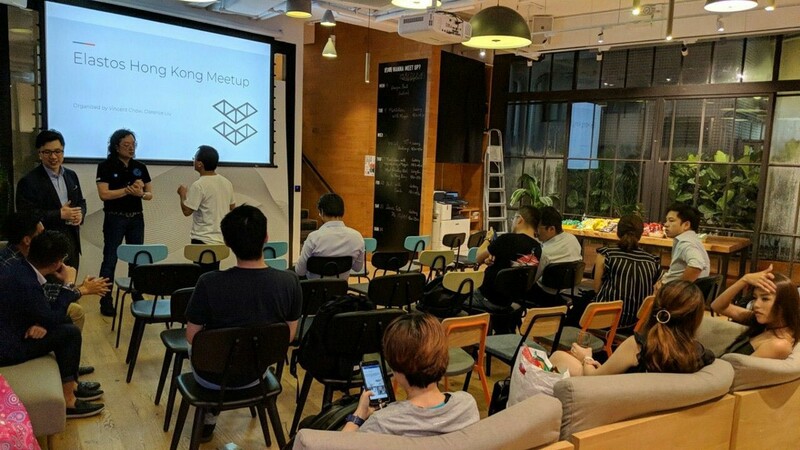 Elastos hosted a meetup in Hong Kong. 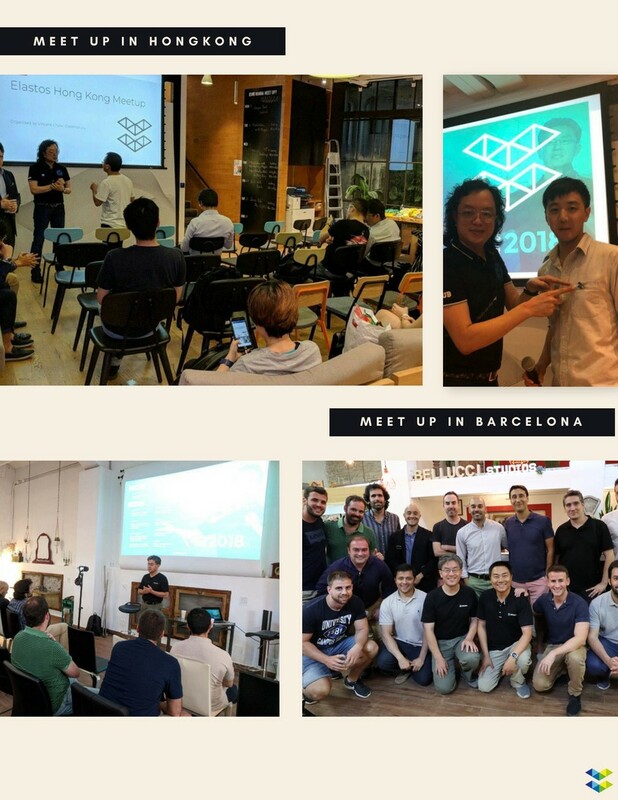 Rong Chen and Kevin Zhang hosted a meetup in Barcelona. Jeremy from G.C. Crypto posted an insightful video called “When Exchanges?” to his Youtube Channel. 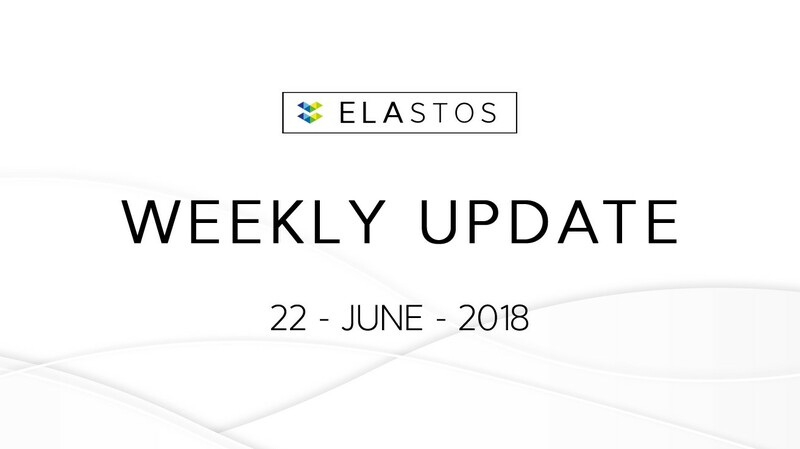 Sludgefeed did a review of Elastos on their site. 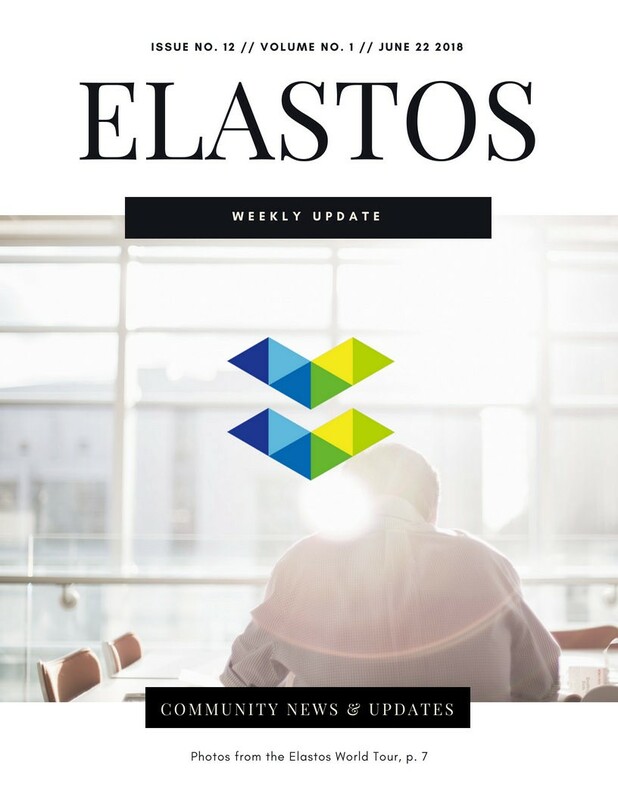 CoinBeureau posted a review of Elastos to their site. 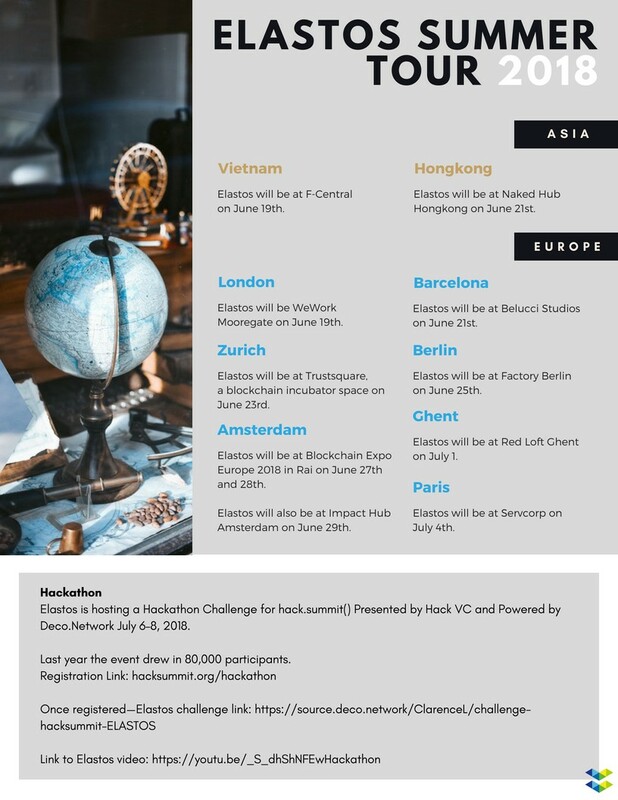 Elastos is hosting a Hackathon Challenge for hack.summit() Presented by Hack VC and Powered by Deco.Network July 6–8, 2018. Last year the event drew in 80,000 participants. This week, in light of the coming opening of Cyber Republic, it is time to discuss the concept of networks. Understanding networks is an important context to understanding why Cyber Republic and Elastos as a whole adheres to the philosophy it does. 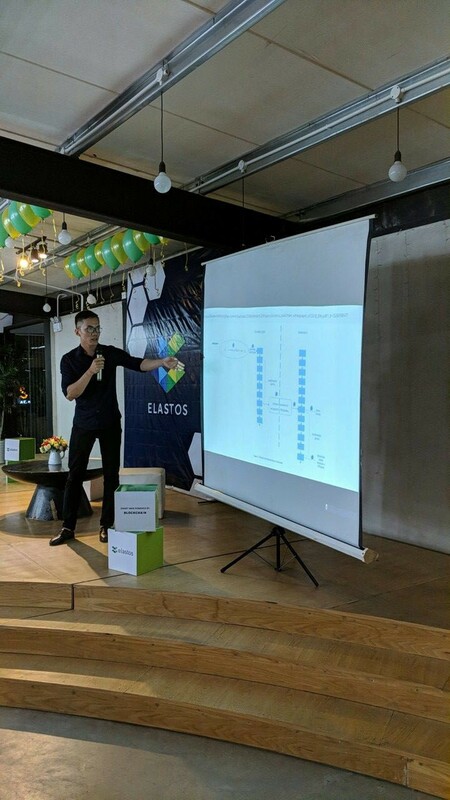 The idea of Elastos was not created in a vacuum. Understanding global shifts help contextualize how many areas of our world are changing in unison and have been for some time. These processes develop over decades, but once they start, these new directions can be watched with a perspective towards the whole instead of the individual parts. We need to begin to view this topic from a very wide perspective to begin to see that all things in this universe are interconnected, including human consciousness, and that Elastos sprang forth not from one person’s mind, but from everything that connects to that mind too. 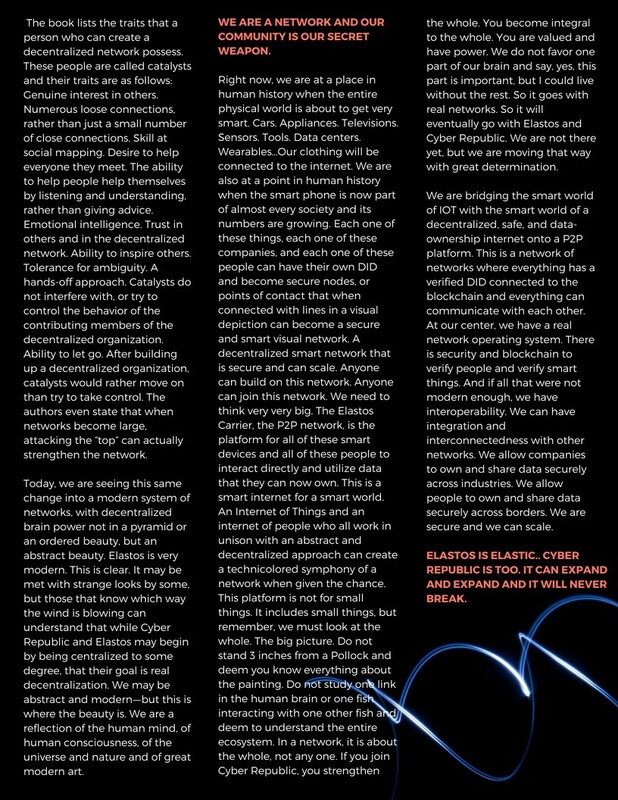 Cyber Republic is a community, or network of people, who want to help build Elastos. Any person can join. Any developer, any non-developer. By creating and helping complete tasks, each person can gain ELA as a volunteer. People from all over the world will create a large network that is direct, decentralized, global, and inclusive. But what is a network and why are they important? To begin, we must look closely at the brilliant work of Manuel Lima. Much of Mr. Lima’s work has focused on how people organize and visualize information. He has been called “the man who turns data into art,” and is a frequent lecturer on topics of design, art, history, and his research of networks and their visualization. He is also the current Design Lead at Google. 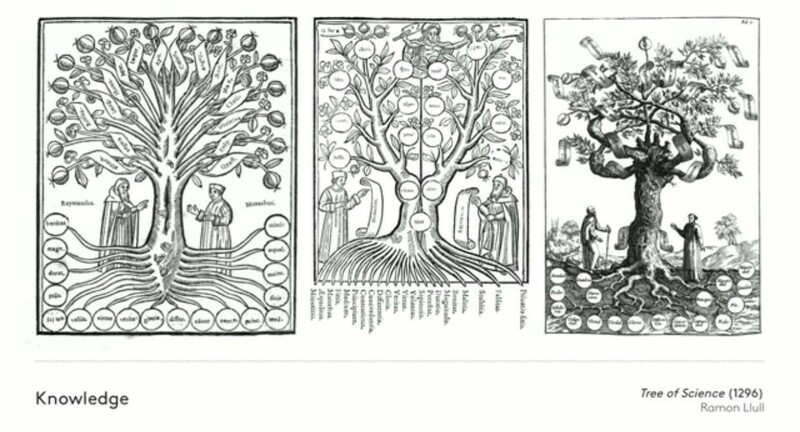 Mr. Lima begins his lectures by describing the metaphor, for the mode of organization of knowledge and power, for much of human history: the tree. Trees represent the natural ranking order of the world. The “great chain of being” or “scala naturae.” Trees have always been an important part of our cultures. 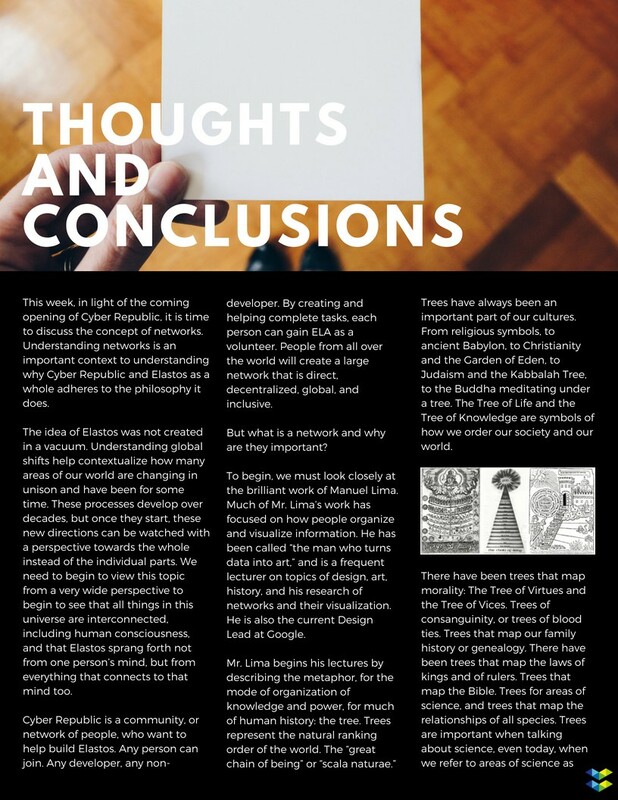 From religious symbols, to ancient Babylon, to Christianity and the Garden of Eden, to Judaism and the Kabbalah Tree, to the Buddha meditating under a tree. The Tree of Life and the Tree of Knowledge are symbols of how we order our society and our world. There have been trees that map morality: The Tree of Virtues and the Tree of Vices. Trees of consanguinity, or trees of blood ties. Trees that map our family history or genealogy. There have been trees that map the laws of kings and of rulers. Trees that map the Bible. 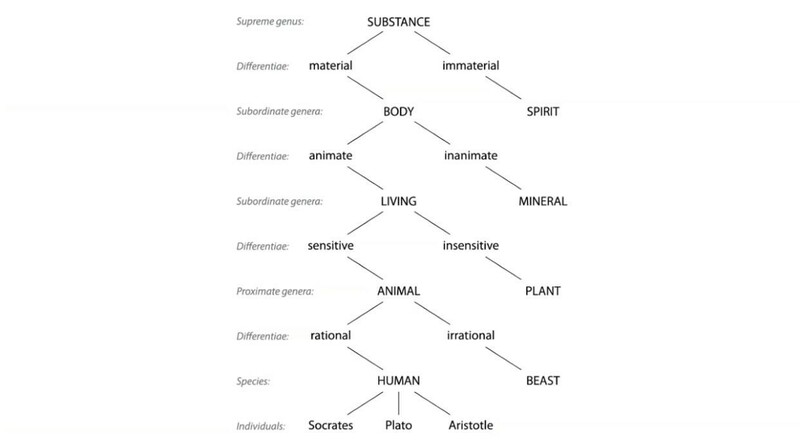 Trees for areas of science, and trees that map the relationships of all species. Trees are important when talking about science, even today, when we refer to areas of science as branches of science. Trees have been the ultimate metaphor for humanity because they represent order, symmetry, simplicity, balance, unity, and most importantly, hierarchy. Ancient depictions of trees are quite beautiful and show how antiquity ordered both life and knowledge. One of the oldest models of the tree comes from Aristotle. He attempted to order all of the knowledge of the world at the time into a tree, with substance at the very top, and man, or himself, at the very bottom. This is the classic tree model. It is like a pyramid. Its power is hierarchical and goes from the top down. 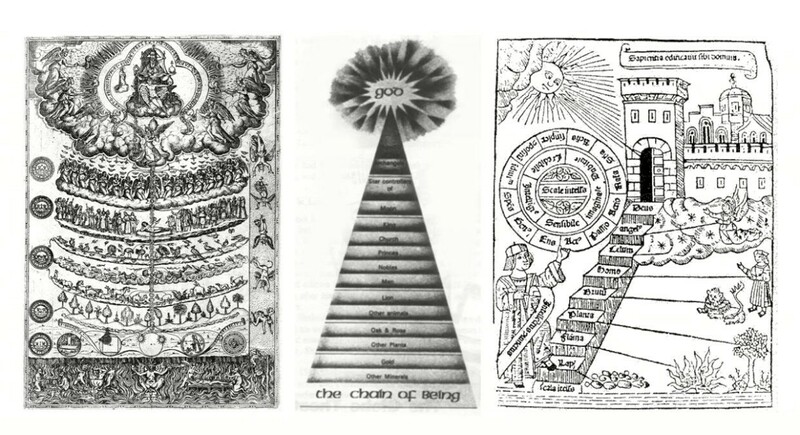 The top influences to level below it and then the level below that and so on. Branches of a tree do not connect to each other directly. For much of human history, including ancient Greece, this model made sense. These previous models were models of simplicity. The tree, with substance, or power at the top, was a way to order this simplicity. Long before the onset of modern science and modern technology, Aristotle and those who followed after him could not see the complexities of how the universe works nor could they enable connection with people in other parts of the world. But with modern advancements in science and technology, there has been a paradigm shift. Trees can no longer be a metaphor for the modern world to answer the question of how things influence each other in our universe. We now need a new metaphor to organize our world. That metaphor is the network. A network is not like a tree. Networks represent nonlinearity, decentralization, interconnectedness, interdependence, and multiplicity. 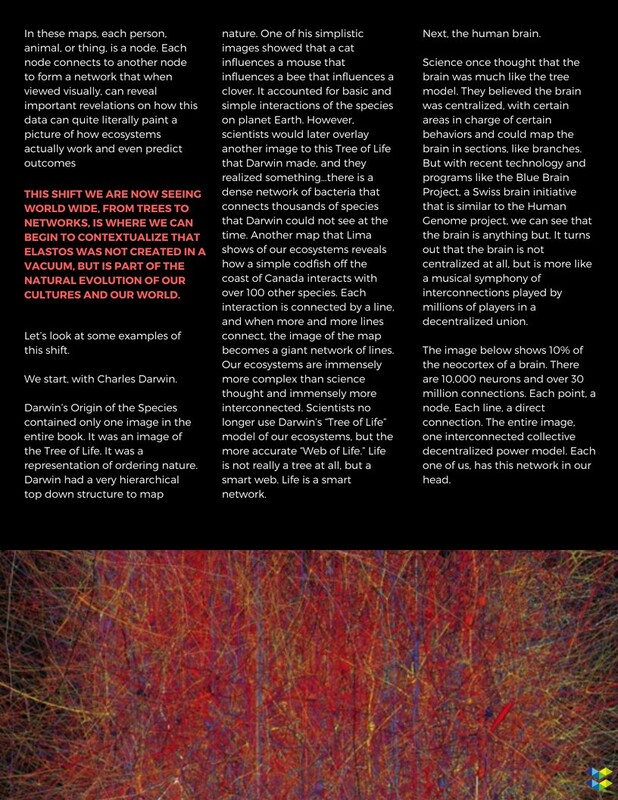 Networks, unlike trees, are abstract. But networks, like trees, can be quite gorgeous. 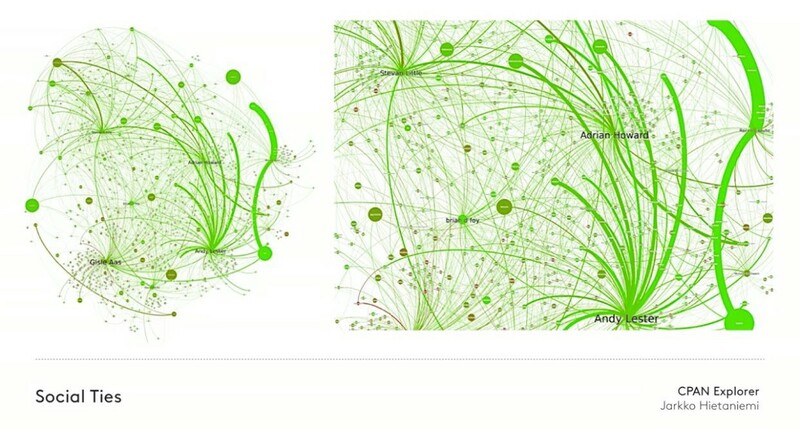 This has led Manuel Lima to map and visualize the beauty and power of networks. Some of the causes of being able to map this shift are that: our ability to generate data has far outpaced our ability to understand that data, data has become widely accessible and has become its own currency, advanced visualization software has been created to map this data, and some social social scientists, like Mr. Lima, believe that mapping data and understanding networks can actually lead to understanding human behavioral and social evolution, and our world at large. Lima is part of a project called Visual Complexity, whose self-described goal is to, “leverage a critical understanding of different visualization methods, across a series of disciplines, as diverse as Biology, Social Networks, or the World Wide Web.” Lima has mapped knowledge networks, social networks, art, the world wide web, biology, transportation networks, music, computer systems, business networks, political networks, food webs. In these images, one is just as likely to find a map of a protein network as a subway network. The larger point being, the universe is a network. His goal is to find a holistic approach to mapping these networks. 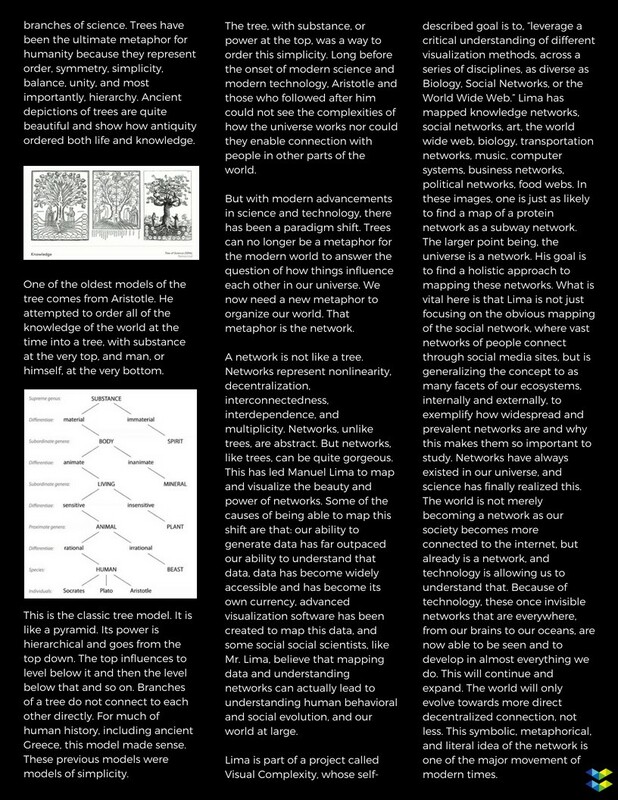 What is vital here is that Lima is not just focusing on the obvious mapping of the social network, where vast networks of people connect through social media sites, but is generalizing the concept to as many facets of our ecosystems, internally and externally, to exemplify how widespread and prevalent networks are and why this makes them so important to study. Networks have always existed in our universe, and science has finally realized this. The world is not merely becoming a network as our society becomes more connected to the internet, but already is a network, and technology is allowing us to understand that. Because of technology, these once invisible networks that are everywhere, from our brains to our oceans, are now able to be seen and to develop in almost everything we do. This will continue and expand. The world will only evolve towards more direct decentralized connection, not less. This symbolic, metaphorical, and literal idea of the network is one of the major movement of modern times. In these maps, each person, animal, or thing, is a node. Each node connects to another node to form a network that when viewed visually, can reveal important revelations on how this data can quite literally paint a picture of how ecosystems actually work and even predict outcomes. This shift we are now seeing world wide, from trees to networks, is where we can begin to contextualize that Elastos was not created in a vacuum, but is part of the natural evolution of our cultures and our world. Let’s look at some examples of this shift. We start, with Charles Darwin. Darwin’s Origin of the Species contained only one image in the entire book. It was an image of the Tree of Life. It was a representation of ordering nature. Darwin had a very hierarchical top down structure to map nature. One of his simplistic images showed that a cat influences a mouse that influences a bee that influences a clover. It accounted for basic and simple interactions of the species on planet Earth. However, scientists would later overlay another image to this Tree of Life that Darwin made, and they realized something…there is a dense network of bacteria that connects thousands of species that Darwin could not see at the time. Another map that Lima shows of our ecosystems reveals how a simple codfish off the coast of Canada interacts with over 100 other species. Each interaction is connected by a line, and when more and more lines connect, the image of the map becomes a giant network of lines. Our ecosystems are immensely more complex than science thought and immensely more interconnected. Scientists no longer use Darwin’s “Tree of Life” model of our ecosystems, but the more accurate “Web of Life.” Life is not really a tree at all, but a smart web. Life is a smart network. Science once thought that the brain was much like the tree model. They believed the brain was centralized, with certain areas in charge of certain behaviors and could map the brain in sections, like branches. But with recent technology and programs like the Blue Brain Project, a Swiss brain initiative that is similar to the Human Genome project, we can see that the brain is anything but. It turns out that the brain is not centralized at all, but is more like a musical symphony of interconnections played by millions of players in a decentralized union. The image above shows 10% of the neocortex of a brain. There are 10,000 neurons and over 30 million connections. Each point, a node. Each line, a direct connection. The entire image, one interconnected collective decentralized power model. Each one of us, has this network in our head. 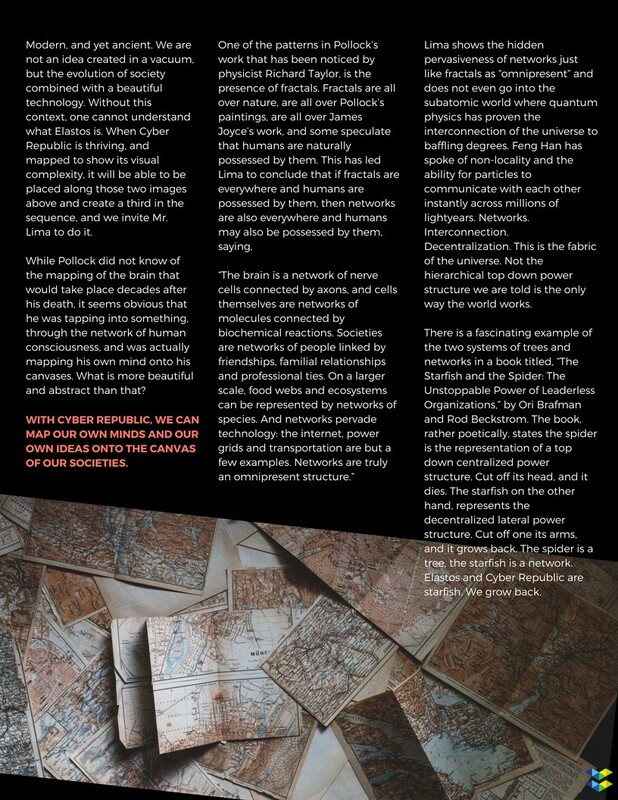 Cyber Republic is a decentralized brain. 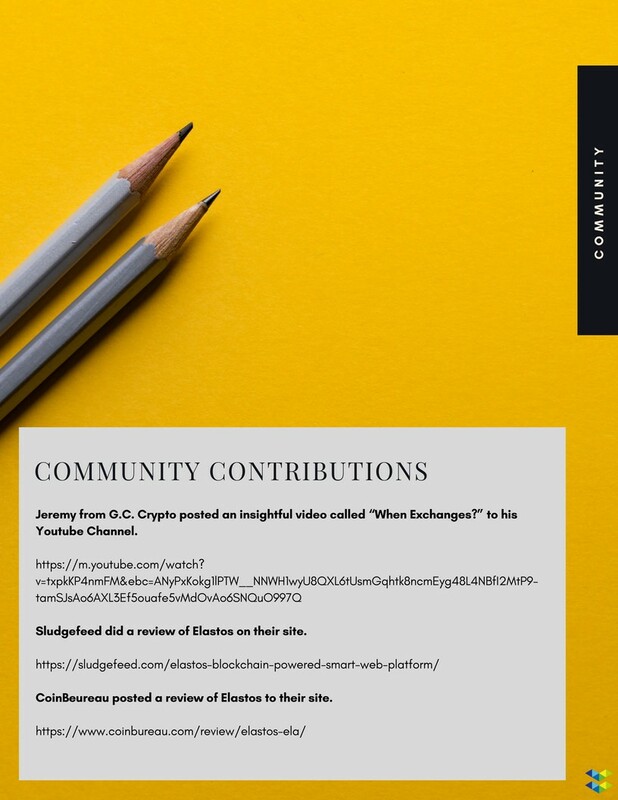 Each community member is one node that connects to the whole to create a musical symphony. Human knowledge has a long history of being separated into categories or branches. We study subjects separately in school and are taught that these subjects are independent from each other in many cases. The tree model has always worked well for human knowledge. In 1751, the French Encyclopedia became the most thorough compilation of human knowledge at that time. It ordered subjects into branches. 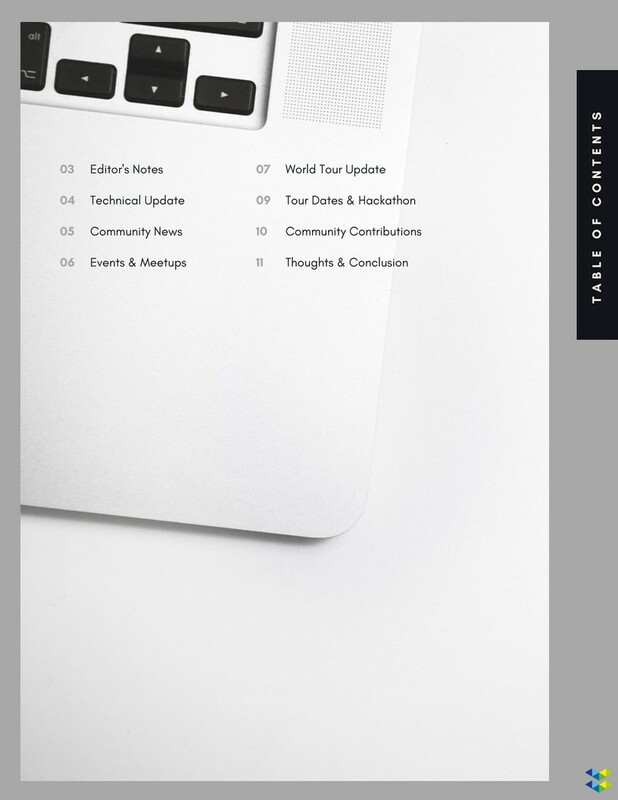 It contained 71,818 articles. This was massive for the time and exemplified the separateness of knowledge. 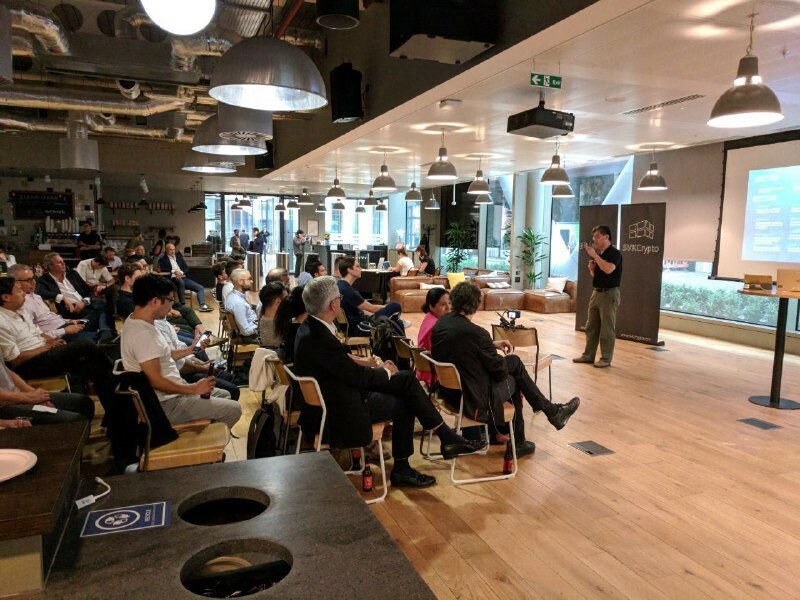 But today, many humans have begun to classify knowledge in an open sourced, decentralized, and highly interconnected way. Wikipedia is a profound example of society being incentivized to grow a project, without leaders, without a pyramid of power, but with the goal of simply getting the information right and improving society, therefore improving their own lives. By today’s count, Wikipedia has over 5,662,000 articles. All of these articles are highly interconnected and contain links to other articles. Global Wikipedia use has been mapped and its images are nothing like the hierarchical Tree of Knowledge, but show that knowledge is also a network that is highly interconnected and interdependent. Wikipedia not only shows the network of knowledge but it also shows the network of people that assemble that knowledge, mirroring the process with the result. Cyber Republic is the network that builds and assembles the result which is also a network. Next, how we organize ourselves. After the industrial revolution, society has had a very hierarchical structure. In a company, we are all familiar with the structure of the CEO at the top, and at the very bottom we have the lowest worker. At Amazon today, we can see Jeff Bezos at the top making the yearly median salary of his workers at the bottom every 9 seconds. 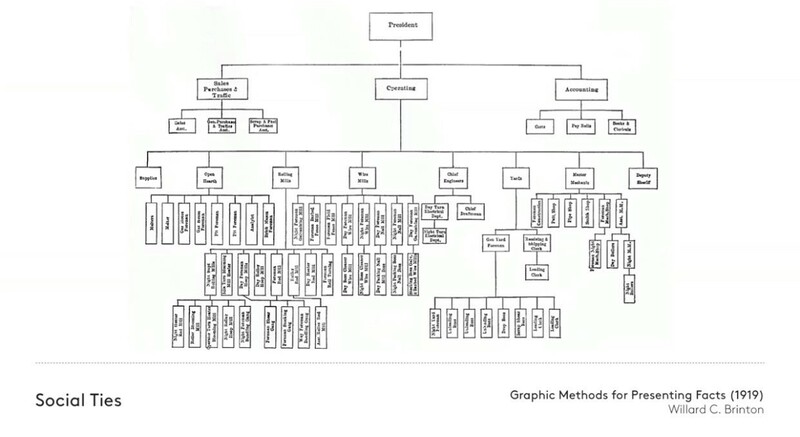 This is truly a hierarchical tree model structure and is common throughout the world. In this structure, humans have to conform to the rigid logic of this pyramid and in many ways, it goes against our nature. Ask an employee at the bottom or the middle of such a structure if this model feels intuitively correct to them. To contrast this rather mundane image, Lima shows a chart mapping Pearl developers collaborating on open source projects and the beautiful patterns the mapping creates. Here we see not a tree at all, but an abstract and yet innately pleasurable viewing experience. Something within us recognizes the beauty of decentralized interconnection. It is not rigid, but free flowing. Not logical, but abstract. It is not a simple image, but art. Which bring us to art. For centuries, art represented a certain kind of order, and our notions of beauty went along with these values. But with the onset of modernism in art, the notions of beauty began to change. Poets like Arthur Rimbaud in late 19th century France, and later in early 20th century literature, James Joyce, ushered in new forms of beauty in writing. Abstract painting movements like Surrealism, Cubism, Futurism, and then Abstract Expressionism, all changed our notions of beauty and explored interconnections that were met with some level of resistance, but eventually, were generally accepted as beautiful. The visual aspects of mapping networks intersects with the arts. To break down a painting like Vincent van Gogh’s Starry Night, we see the elements of dot, line, color, shape, direction, texture, scale, dimension, and motion. These elements can combine to create balance and instability, symmetry and asymmetry, transparency and opacity, accuracy and distortion, sharpness and diffusion, flatness and depth, predictability and spontaneity, regularity and irregularity, subtlety and boldness. However, all of these elements and the balances and beautiful juxtapositions that they create do not make the work of art great in and of themselves. In painting, in music, in dance, in poetry, in cinema, in sculpture, in photography…the whole is other than, or even greater than, the some of its parts. This idea was popularized by The Berlin School of Experimental Psychology in the early 20th century and particularly Gestalt psychology which dealt with the perception of the world. The Gestalt effect was that one experiences the perception of a whole as different than the perception of the individual parts. Many take that to mean greater than. 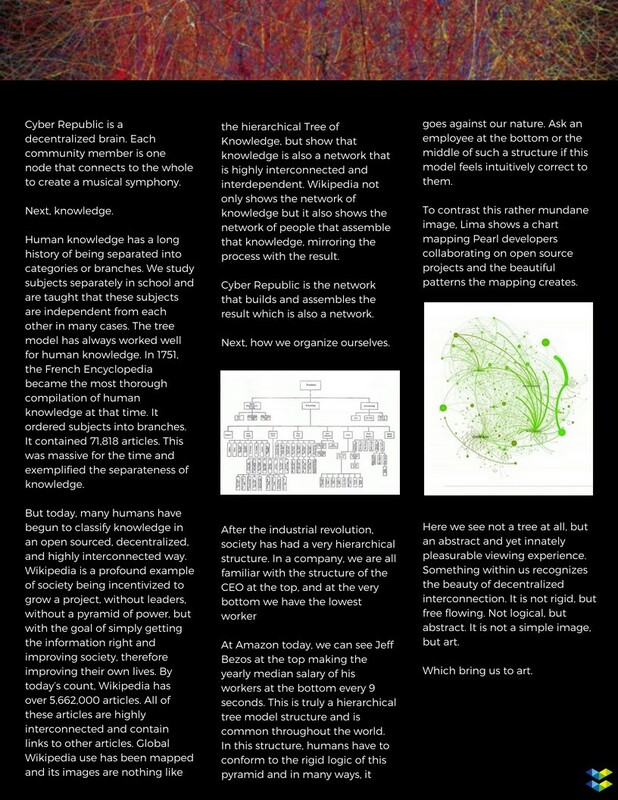 The idea is about how no mere collection of dots and lines, or in our case, people and nodes, can summarize the whole. One must see them as a fully identifiable pattern. In a painting, we cannot look at one corner of the work and understand the painting. In Elastos, we cannot look at one person, or one idea, even if they appear more important, and understand the whole. In a network, one must look at the whole with a wide angle lens. It is the connection of these elements that create the whole, not any one element by itself. Cyber Republic is a about the whole. It becomes stronger with each new connection, with each new person and their unique contribution. This is beauty. 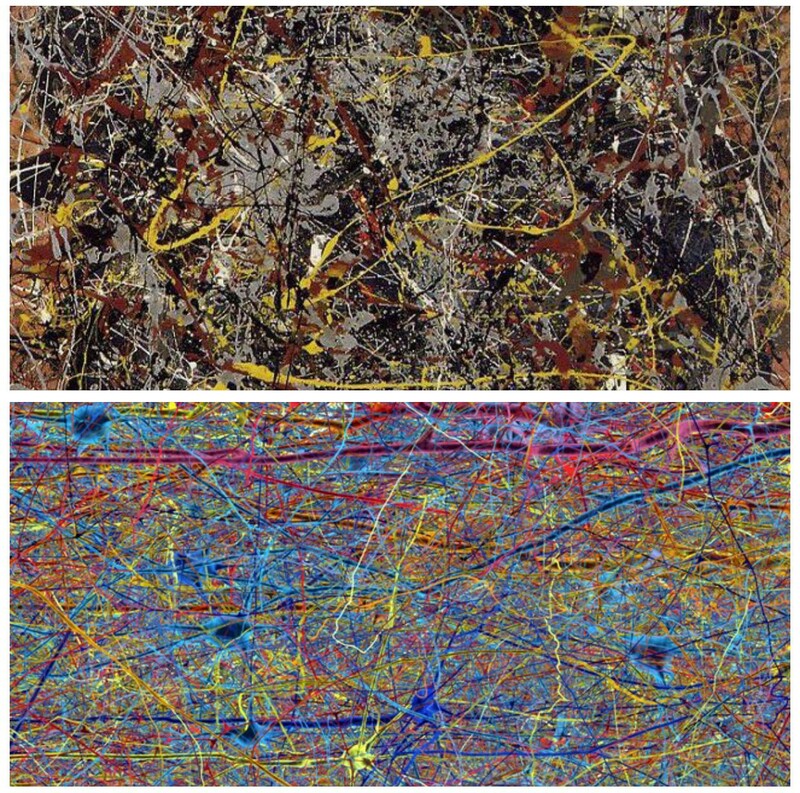 In the image above, one is a map of the brain by the Human Brain Project, a project co-funded by the European Union, and the other is a Jackson Pollock. We can see the abstract and decentralized power that both have when viewed as a whole. No one line or point is central and in charge. All work in unison with lateral power to create a truly magnificent work. To see the human brain and a great painting look remarkably similar shows how networks are truly everywhere and truly important and even natural and beautiful to humans. Networks do not go against our nature, but towards it. This is what Cyber Republic and Elastos are. With each person, with each idea, with each thing, with each node, we are creating a fully decentralized virtual country where we will reflect the very same order of the natural world, of the art world, and of the universe itself. We are new, and yet not new. Modern, and yet ancient. We are not an idea created in a vacuum, but the evolution of society combined with a beautiful technology. Without this context, one cannot understand what Elastos is. 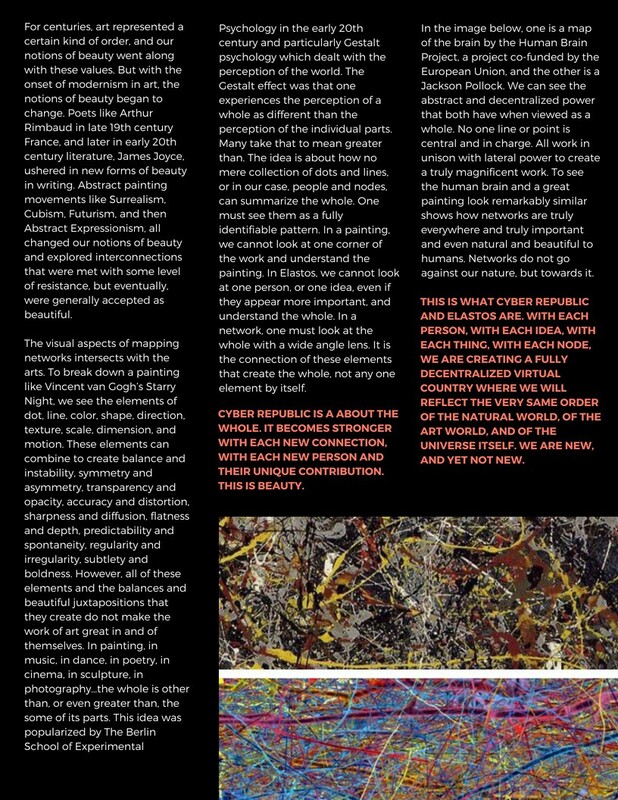 When Cyber Republic is thriving, and mapped to show its visual complexity, it will be able to be placed along those two images above and create a third in the sequence, and we invite Mr. Lima to do it. 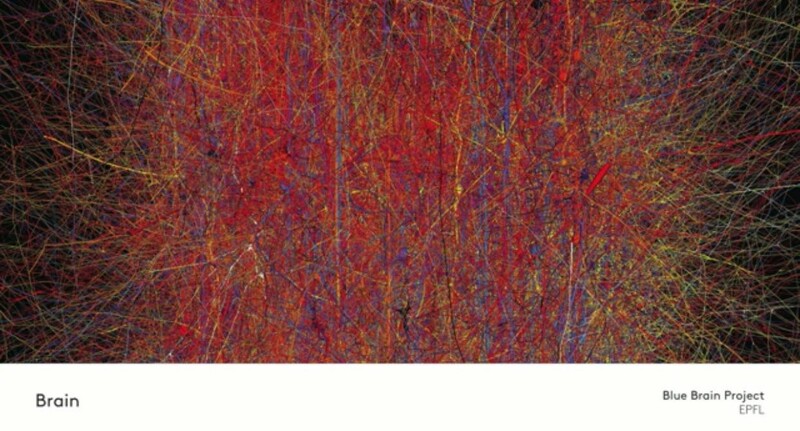 While Pollock did not know of the mapping of the brain that would take place decades after his death, it seems obvious that he was tapping into something, through the network of human consciousness, and was actually mapping his own mind onto his canvases. What is more beautiful and abstract than that? 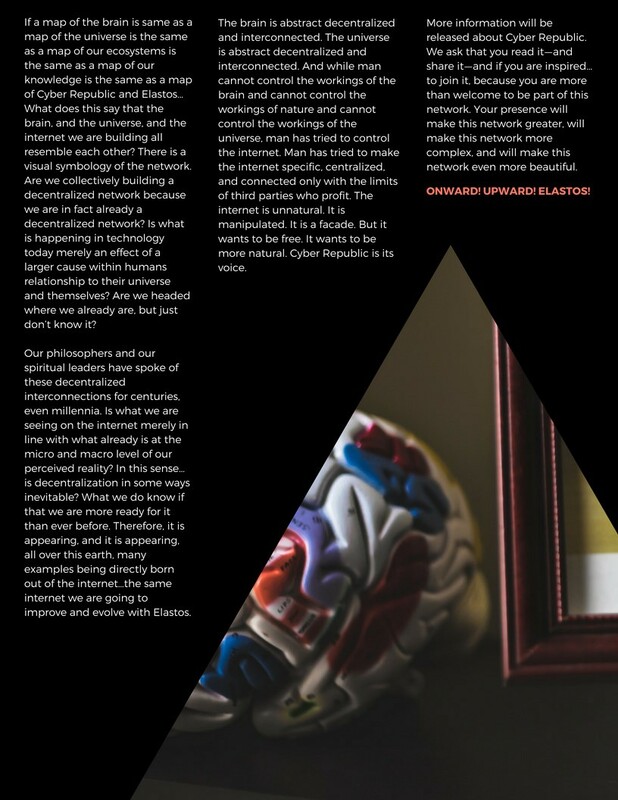 With Cyber Republic, we can map our own minds and our own ideas onto the canvas of our societies. Lima shows the hidden pervasiveness of networks just like fractals as “omnipresent” and does not even go into the subatomic world where quantum physics has proven the interconnection of the universe to baffling degrees. Feng Han has spoke of non-locality and the ability for particles to communicate with each other instantly across millions of lightyears. Networks. Interconnection. Decentralization. This is the fabric of the universe. Not the hierarchical top down power structure we are told is the only way the world works. There is a fascinating example of the two systems of trees and networks in a book titled, “The Starfish and the Spider: The Unstoppable Power of Leaderless Organizations,” by Ori Brafman and Rod Beckstrom. The book, rather poetically, states the spider is the representation of a top down centralized power structure. Cut off its head, and it dies. The starfish on the other hand, represents the decentralized lateral power structure. Cut off one its arms, and it grows back. The spider is a tree, the starfish is a network. Elastos and Cyber Republic are starfish. We grow back. The book lists the traits that a person who can create a decentralized network possess. These people are called catalysts and their traits are as follows: Genuine interest in others. Numerous loose connections, rather than just a small number of close connections. Skill at social mapping. Desire to help everyone they meet. The ability to help people help themselves by listening and understanding, rather than giving advice. Emotional intelligence. Trust in others and in the decentralized network. Ability to inspire others. Tolerance for ambiguity. A hands-off approach. Catalysts do not interfere with, or try to control the behavior of the contributing members of the decentralized organization. Ability to let go. After building up a decentralized organization, catalysts would rather move on than try to take control. The authors even state that when networks become large, attacking the “top” can actually strengthen the network. Today, we are seeing this same change into a modern system of networks, with decentralized brain power not in a pyramid or an ordered beauty, but an abstract beauty. 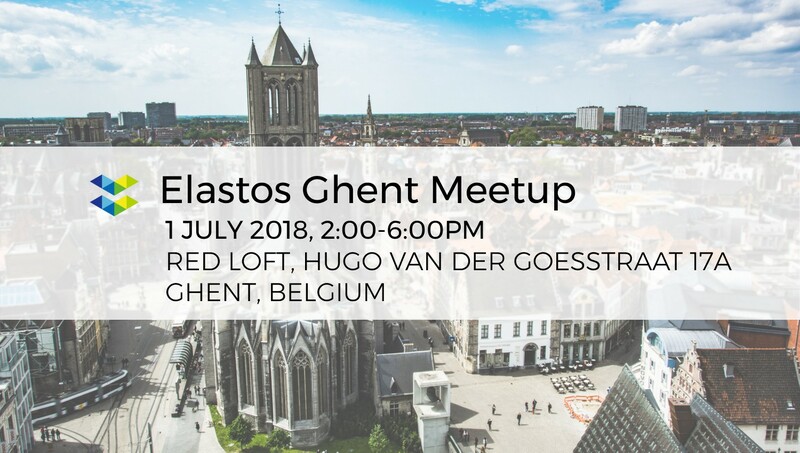 Elastos is very modern. This is clear. It may be met with strange looks by some, but those that know which way the wind is blowing can understand that while Cyber Republic and Elastos may begin by being centralized to some degree, that their goal is real decentralization. We may be abstract and modern — but this is where the beauty is. We are a reflection of the human mind, of human consciousness, of the universe and nature and of great modern art. We are a network and our community is our secret weapon. Right now, we are at a place in human history when the entire physical world is about to get very smart. Cars. Appliances. Televisions. Sensors. Tools. Data centers. Wearables…Our clothing will be connected to the internet. We are also at a point in human history when the smart phone is now part of almost every society and its numbers are growing. Each one of these things, each one of these companies, and each one of these people can have their own DID and become secure nodes, or points of contact that when connected with lines in a visual depiction can become a secure and smart visual network. A decentralized smart network that is secure and can scale. Anyone can build on this network. Anyone can join this network. We need to think very very big. The Elastos Carrier, the P2P network, is the platform for all of these smart devices and all of these people to interact directly and utilize data that they can now own. This is a smart internet for a smart world. An Internet of Things and an internet of people who all work in unison with an abstract and decentralized approach can create a technicolored symphony of a network when given the chance. This platform is not for small things. It includes small things, but remember, we must look at the whole. The big picture. Do not stand 3 inches from a Pollock and deem you know everything about the painting. Do not study one link in the human brain or one fish interacting with one other fish and deem to understand the entire ecosystem. In a network, it is about the whole, not any one. If you join Cyber Republic, you strengthen the whole. You become integral to the whole. You are valued and have power. We do not favor one part of our brain and say, yes, this part is important, but I could live without the rest. So it goes with real networks. So it will eventually go with Elastos and Cyber Republic. We are not there yet, but we are moving that way with great determination. We are bridging the smart world of IOT with the smart world of a decentralized, safe, and data-ownership internet onto a P2P platform. This is a network of networks where everything has a verified DID connected to the blockchain and everything can communicate with each other. At our center, we have a real network operating system. There is security and blockchain to verify people and verify smart things. And if all that were not modern enough, we have interoperability. We can have integration and interconnectedness with other networks. We allow companies to own and share data securely across industries. We allow people to own and share data securely across borders. We are secure and we can scale. Elastos is elastic.. Cyber Republic is too. It can expand and expand and it will never break. If we connect every node, every virtual machine, every member of Cyber Republic, we could one day see a fantastic abstract expressionistic canvas of networks that beautifully depicts not only Elastos, but our species, our world, the universe itself. If a map of the brain is same as a map of the universe is the same as a map of our ecosystems is the same as a map of our knowledge is the same as a map of Cyber Republic and Elastos… What does this say that the brain, and the universe, and the internet we are building all resemble each other? There is a visual symbology of the network. Are we collectively building a decentralized network because we are in fact already a decentralized network? Is what is happening in technology today merely an effect of a larger cause within humans relationship to their universe and themselves? Are we headed where we already are, but just don’t know it? Our philosophers and our spiritual leaders have spoke of these decentralized interconnections for centuries, even millennia. Is what we are seeing on the internet merely in line with what already is at the micro and macro level of our perceived reality? In this sense… is decentralization in some ways inevitable? What we do know if that we are more ready for it than ever before. 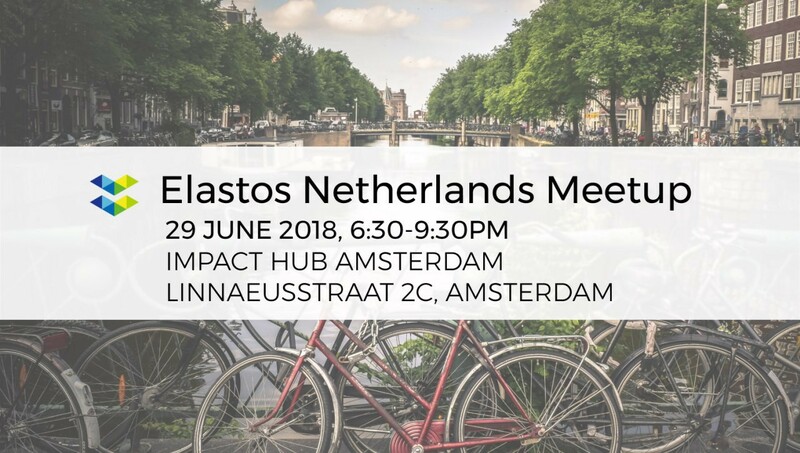 Therefore, it is appearing, and it is appearing, all over this earth, many examples being directly born out of the internet…the same internet we are going to improve and evolve with Elastos. The brain is abstract decentralized and interconnected. The universe is abstract decentralized and interconnected. And while man cannot control the workings of the brain and cannot control the workings of nature and cannot control the workings of the universe, man has tried to control the internet. Man has tried to make the internet specific, centralized, and connected only with the limits of third parties who profit. The internet is unnatural. It is manipulated. It is a facade. But it wants to be free. It wants to be more natural. Cyber Republic is its voice. 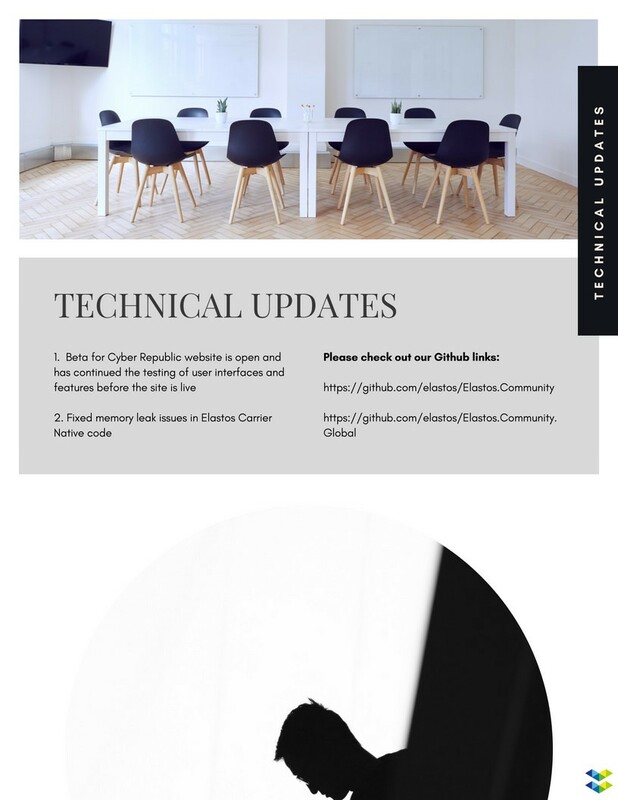 More information will be released about Cyber Republic. We ask that you read it — and share it — and if you are inspired…to join it, because you are more than welcome to be part of this network. Your presence will make this network greater, will make this network more complex, and will make this network even more beautiful.